Can I Disinfect My Invisalign in the Dishwasher? I am rather OCD and really struggle with germs. I wash my whole house from top to bottom with bleach every month. I constantly wash my hands. I’m telling you this so you get an idea of how much germs bother me. I’ve been trying to not wig out about wearing the same aligners in my mouth for two weeks straight. I’m brushing my teeth and the aligners several times a day, but I’m thinking once a week they may need a deep disinfectant. Can I run them through the dishwasher? I think the heat will help kill any germs. I understand you’re concerned about germs. I appreciate you explaining in detail what you do to help me get a full picture of your concern. I’m going to give you a way to disinfect your aligners, but am going to warn you off putting them in the dishwasher. That same heat you were thinking will disinfect the aligners will actually do more damage than good. The heat will warp them. Plus, the detergent is almost always abrasive which will scratch up the Invisalign aligners causing them to pick up stains. When the aligners get warped out of shape it will completely throw off your treatment. I know you’re bothered by them being in your mouth. First, I want to make sure you know that your saliva has specific minerals in it to fight bacteria. That’s why patients with dry mouth are more prone to cavities. They don’t have as many bacteria fighting minerals in their mouth. But, there are other safe things you can do. It’s good that you’re regularly brushing after meals. Be careful you’re not brushing too hard or using an abrasive toothpaste. You don’t want to scratch up your aligners while you clean them. As far as disinfecting goes, vinegar is a natural disinfectant. You can soak them for 30 minutes about once a week full strength. You’ll want to rinse them off well afterward so you don’t have that bitter taste. If you want to do it more than once per week, you don’t want to do it full-strength. Instead, do a 50/50 mixture of vinegar and water. 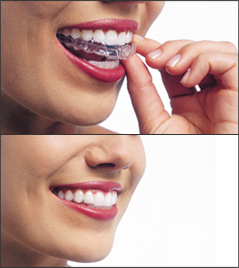 Did you know your Invisalign aligners could also double as teeth whitening trays? That’s another handy way to have some disinfectant on your teeth. You’ll have the whitening gel to both disinfect and give you a stunning white smile all at the same time. My husband complained that his mouth was hurting too much to eat. I thought he was just avoiding vegetables, but he didn’t eat dessert either. I took a peek and he has a horrible spot in his mouth that looks like his skin is getting eaten away. He’s sure it’s just a canker sore and thinks it will go away. I’m worried it’s oral cancer. Is there a way to know? Would we see an emergency dentist to find out? Your husband’s dentist likely does an oral cancer screening at his check-ups. If he hasn’t seen any warning signs, then it is likely just a canker sore. These will generally clear up in about two weeks. There’s no reason for an emergency dentist yet. There are over-the-counter remedies you can try which could help with some of the pain. While they make pads to cover them, quite a few patients have found that saliva makes it difficult to keep them in place. I’ve found relief (though only temporarily) with some numbing cream. If you’ve found it hasn’t healed after a couple of weeks, then you can schedule an appointment with your dentist to have a peek at it. Not healing quickly doesn’t necessarily mean it’s cancer. It could just as easily be a virus or simply a canker sore taking a wee bit longer to heal, so I don’t want you stressing over it.